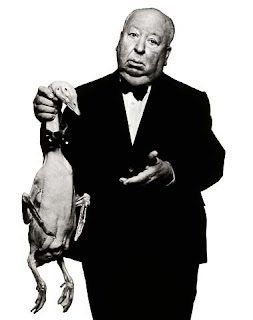 Thanksgiving for many years has included a hefty lineup of Alfred Hitchcock films in my house. I love Hitch pictures, especially “Vertigo,” “The Birds,” “Rear Window,” “North By Northwest” and “Psycho.” One Thanksgiving, I just happened to catch a few of the suspense master’s movies on TV, and I’ve since made a habit of watching them on the big turkey day each year. I feel a major Hitch fest coming on this year, as I’m starting to feel a major cold coming on, which could leave me in bed in front of the TV all day. Ah, I remember the year I was sick on Thanksgiving. I got the worst cold The Sick Fairy had ever dealt me, and was marooned on my mattress island all day -- almost the same way Jimmy Stewart was confined to his wheelchair due to a broken leg in “Rear Window.” At the time, I lived in an apartment complex. Just like Jimmy Stewart’s character in "Rear Window," I found myself infringing upon the lives of my neighbors through two panes of glass. I saw that The Newlyweds of the complex were anxious to share their first Thanksgiving together. The table was romantically set for two, Christmas music leaking out the open windows into the warm Southern California air. The Newlyweds were sharing the turkey basting duties. How cute. The people next door to The Newlyweds, the people I came to call The Castaways for the lack of technological enhancements in their lives, had brought a live turkey into their apartment. I supposed they were going to kill it for dinner -- something I supposed would not affect me in the least. Perhaps the most entertaining tenants in the apartment complex were the members of The Family Musical. I gave them that name because they sang their dinners to the table. I’d hear them singing in the shower, at parties, and, yup, they were singing about Thanksgiving dinner. The evening got exciting when The Castaways did away with their live turkey by way of -- what sounded like -- a shotgun. I noticed all my neighbors, with the exception of The Newlyweds (who had closed the curtains), came to their windows to investigate the loud noise. No signs of a shooting could be found. Most of my neighbors went back to their holiday plans. The Family Musical, however, picked up the phone. I imagine they were singing the report to the police. Just then I spotted The Castaway boy, maybe 10 or 12 years old, sneaking across the alleyway toward my garage below with . . . a smoking shotgun! As I tried to raise my body out of the bed, my reflexes instantly responded, and my hands reached for my head in an attempt to relieve the extreme pressure squeezing my brain. I fell to the floor in pain. And then I heard a knock at the door. The cops, no doubt. I stood up in a mad panic and ran toward the front window on the second level of the apartment so I could view the individual behind my front door. Before I could reach the window, a sneeze snuck up behind my nasal passage and sent my body up and over the banister of the stairwell in the hallway. I hung from the banister like Jimmy Stewart’s character in “Vertigo,” fearing for my life in just the same way. The cops busted the door in and sent such a shock through my body that the vibrations made my fingers release their grasp of the banister railing, which left me falling down, down, down. My wife found me lying on the tile entryway, blood surrounding my body. “Why is there chocolate syrup all over the floor?” she asked me. As my wife helped me to the bed, I promised her I’d lay off the Hitchcock films. I ejected “Psycho” from my DVD player only to find that “The Birds” was, surprisingly, playing on cable. My Hitch addiction took hold of my every muscle and forced me to watch. Later that night, a swarm of Thanksgiving turkeys came down and attacked my wife and me while we were asleep. The next morning we found ourselves covered in -- you guessed it -- chocolate syrup. Yup, Thanksgiving is coming soon, The Sick Fairy is waving her wand upon me, and I’m looking forward to a long lineup of Hitch flicks. Only it seems my wife has hidden my Hitchcock DVD collection and the chocolate syrup. That’s a true story. Happy Thanksgiving.